The map is accurate in the post below. Just MapQuest or Google 173 Old Boston Rd in Wilton, CT. If you need further info please email me (WB2JVB “at” arrl.net). The GNARC annual picnic will be taking place very soon, specifically on Aug. 7th. “But wait”, you might say, “that isn’t a Wednesday!”. Well, indeed it isn’t. At the last meeting the membership voted, and the consensus was that in general Thursday tends to be a more relaxing day of the week, so we’re going with that. GNARC has a new home!! Thanks to the City of Norwalk, Fire Marshal Chris Hansen, WO1T, and Fire Chief Denis McCarthy- GNARC has a new home. We now have an official Club Station/Clubhouse located at the Norwalk Fire Dept. Maintenance facility. Currently the front of the facility is vacant, and we will need to gather our resources together to make this a professional and functional club station and Emergency Operations Center. I am looking for volunteers who are interested in putting in many hours of effort to construct the station, erect the tower and antenna(s), assemble furniture and more. We may also need donations, as well as help moving items from various locations. This is a very exciting opportunity for GNARC and the membership- and I am looking forward to getting on the air from this excellent location. More updates to follow as things develop. Please don’t hesitate to reach out to me directly (email address is on the member directory page). On Wednesday, April 9th, Don Hudson, W1TZR, will be giving an illustrated presentation on the history of Hallicrafters, covering 1934 to 1978. He’s even bringing some of his own equipment to the presentation to give everyone an up close look. All are welcome to come to the meeting! The meeting is held at our normal location, Norwalk Fire Headquarters 121 Connecticut Avenue. Park in the lot on the WEST side of the building, not on the side where the fire trucks exit! On April 2, 2014 the Greater Fairfield Amateur Radio Association will meet at the Fairfield Fire Training Center located at One Rod Highway, Fairfield Ct.
Our speaker will be Joel Hallas, W1ZR. Many of us know Joel as the recently retired Technical Editor of QST and author of the monthly QST column “The Doctor is In”. Joel has written more than 150 articles for QST and authored a half dozen books on technical topics of interest to amateurs. His most recent book is “Understanding Your Antenna Analyzer”. His presentation will describe antenna analyzers, what they do and how to use them. There will be time for Q&A and a follow up Q&A will take place prior to our May meeting to discuss suggested hands on tests. The meeting will be April 2, 2014 at 8:00 PM. in the Annex Building at the Fire Training Center. Please join us for an interesting evening and opportunity to meet other Fairfield Hams. 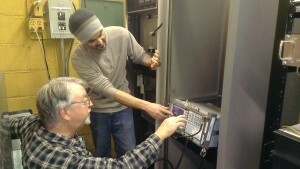 N1LLL and W1FSM using a spectrum analyzer to check out the DSTAR antenna at the repeater site. There is lots of behind the scenes work that keeps your repeaters up and running! Thanks guys! Way back in the Stone Age (or maybe it was the summer of 2011) I started to attend GNARC meetings, and immediately felt welcomed and included. Actually, I was so included in all of the goings on that for 2012 I was elected secretary of the club. After a year of doing that, 2013 saw me becoming vice president, which was quite a surprise to me. Now, in 2014, it is a great honor to be able to address all of you as the president of this fine club. Thanks to lots of hard work and dedication, Tim Walker (W1GIG) secured us a meeting spot in the new Norwalk Fire Headquarters Emergency Operations Center. The work isn’t stopping there. Continuing efforts are being made by our new vice president/repeater trustee, Charles Lelievre (N1LLL), to secure antenna space for the club at this location. He’s also been working with the repeater committee to refurbish and upgrade all of the club repeaters. If you’ve used them lately, you know just how well they are working now. It is no surprise that our repeater system is the busiest in the area. Now that we have a great location and a great repeater system, we need to focus on increasing our already fantastic membership. I know there are a lot of licensed hams who we haven’t heard from in a while. Why not give them a call and see how they are? When you see someone who isn’t a ham expressing interest in homebrewing, electronics, the magic of radio, or anything else we get into as hams, make sure you mention that ham radio is alive and flourishing, and get them to the next meeting. If you happen to see a new face at the meeting, make sure to say hi. You never know if your quick greeting will end up bringing in a future board member. It is that time of year again where we must ask you to pay your dues. We ask that this be done before March 31, after which we’ll be recompiling the official membership list. If we notice that your name didn’t make it over to the new list, one of the board members will be contacting you to check in and see how you are doing. I know that for me events like the yearly picnic, field day, and the holiday party are extremely joyous occasions. However, there should be more to the club than just meetings and parties. Our bylaws heavily emphasize the need to provide learning opportunities. As such, we will organize educational workshops, group builds of simple projects, maybe even the go-box building or a fox hunt that has been talked about for a while. To be able to do these things, GNARC needs operating funds. For the cost of a Baofeng, you will be getting a full year of ham radio fulfillment. And don’t forget all the raffles! It is your past contributions that have made GNARC a thriving club, and we thank you in advance for your continued support! I’m really looking forward to all that will be happening in 2014, and I hope to see everyone at meetings and events.